Delta Cancri (δ Cancri, abbreviated Delta Cnc, δ Cnc) is a double star about 180 light-years from the Sun in the constellation of Cancer. Its two constituents are designated Delta Cancri A and B. A is itself a binary star whose two components are Delta Cancri Aa (formally named Asellus Australis /əˈsɛləs ɔːsˈtreɪlɪs/, the traditional name of the entire system) and Ab. It is 0.08 degree north of the ecliptic, so it can be occulted by the Moon and very rarely by planets. δ Cancri (Latinised to Delta Cancri) is the system's Bayer designation. The designations of the two constituents Delta Cancri A and B, and those of A's components - Delta Cancri Aa and Ab - derive from the convention used by the Washington Multiplicity Catalog (WMC) for multiple star systems, and adopted by the International Astronomical Union (IAU). It bore the traditional name Asellus Australis which is Latin for "southern donkey colt". In 2016, the International Astronomical Union organized a Working Group on Star Names (WGSN) to catalogue and standardize proper names for stars. The WGSN decided to attribute proper names to individual stars rather than entire multiple systems. It approved the name Asellus Australis for the component Delta Cancri Aa on 6 November 2016 and it is now so included in the List of IAU-approved Star Names. Together with Gamma Cancri, it formed the Aselli, flanking Praesepe. 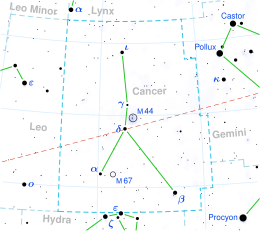 As Arkū-sha-nangaru-sha-shūtu, which means "the southeast star in the Crab", it marked the 13th ecliptic station of the ancient Babylonians. In Chinese astronomy, Ghost (Chinese: 鬼宿; pinyin: Guǐ Xiù) refers to an asterism consisting of Theta Cancri, Eta Cancri, Gamma Cancri and Delta Cancri. Delta Cancri itself is known as the fourth star of Ghost (Chinese: 鬼宿四; pinyin: Guǐ Xiù sì). The most ancient observation of Jupiter which we are acquainted with is that reported by Ptolemy in book X, chap. iii (sic), of the Almagest, ...when the planet eclipsed the star known as (Delta) Cancri. This observation was made on September 3, B.C. 240, about 18h on the meridian of Alexandria. —  Allen, 1898, quoting from Hind's The Solar System). Shining unaltered is a sign of rain. —  Page 146, Moore, 1994. Delta Cancri also marks the radiant of the Delta Cancrids meteor shower. In 1876, the possibility of Delta Cancri having a companion star was proposed. ^ a b c Johnson, H. L.; et al. (1966), "UBVRIJKL photometry of the bright stars", Communications of the Lunar and Planetary Laboratory, 4 (99), Bibcode:1966CoLPL...4...99J. ^ a b c d e Luck, R. Earle (September 2015), "Abundances in the Local Region. I. G and K Giants", The Astronomical Journal, 150 (3): 23, arXiv:1507.01466, Bibcode:2015AJ....150...88L, doi:10.1088/0004-6256/150/3/88, 88. ^ Soubiran, C.; et al. (March 2008), "Vertical distribution of Galactic disk stars. IV. AMR and AVR from clump giants", Astronomy and Astrophysics, 480 (1): 91–101, arXiv:0712.1370, Bibcode:2008A&A...480...91S, doi:10.1051/0004-6361:20078788. ^ a b c Allen, Richard Hinckley, Star Names: Their Lore and Meaning, 1898. ^ Kaler, 2009: "ASELLUS BOREALIS". Archived from the original on 2011-07-16. ^ Burnham, S. W. (1878). "The companion to delta Cancri". The Observatory. 2. Bibcode:1878Obs.....2...60B. Richard H. Allen (28 February 2013). Star Names: Their Lore and Meaning. Courier Corporation. ISBN 978-0-486-13766-7. Robert Burnham (15 April 2013). Burnham's Celestial Handbook, Volume One: An Observer's Guide to the Universe Beyond the Solar System. Courier Corporation. pp. 340–. ISBN 978-0-486-31902-5. James B. Kaler (20 November 2006). The Cambridge Encyclopedia of Stars. Cambridge University Press. ISBN 978-0-521-81803-2. Lloyd Motz; Carol Nathanson (1 November 1988). The constellations. Doubleday. Patrick Moore (13 October 1998). Atlas of the Universe. Cambridge University Press. ISBN 978-0-521-64210-1. Patrick Moore (1994). Stars of the Southern Skies. Penguin. ISBN 978-0-14-024315-4. This page was last edited on 20 April 2019, at 06:58 (UTC).